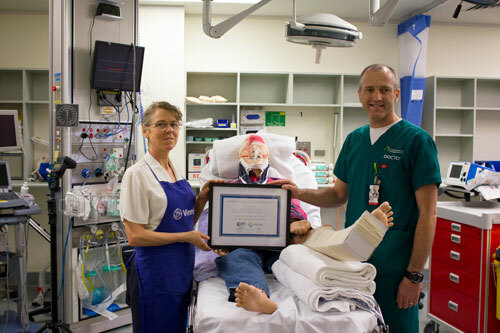 For the past five months the Tuggeranong Vinnies Centre has been supporting the education of doctors in the Canberra Hospital Trauma Section. Centre Manager Jenny Lyons was approached by Canberra Hospital Doctor James Falconer about getting oversized clothes put aside for him after sorting to purchase, to be used for trauma simulation training. Dr Falconer had approached several other charities for support, all of which declined. “If someone asks us for help, we’ll find a way. I was really impressed with Dr Falconer’s commitment to the training program and if we can help better train doctors for emergency situations, that has a positive roll on effect” says Jenny. According to Doctor Falconer, the key component of trauma simulation training is creating a true environment for doctors to learn. This includes dressing medical mannequins, covering them in oil, dirt or water, teaching doctors how to get through clothing fast to find medical problems. “There’s no point in training with a mannequin that’s ready to be treated because that doesn’t teach doctors how to deal with real situations… If there’s been a car accident, chances are the patient will be covered in oil, dirt and even broken glass... We teach doctors to search for the medical problem like they would in a real situation” says Dr Falconer. On the 17th of December, Dr Falconer presented the Vinnies Tuggeranong Centre with a Certificate of Appreciation to thank them for their ongoing support with providing clothes for training. Dr Falconer is extremely appreciative of the help he’s gained from Vinnies.The Tuggeranong Centre looks forward to continuing to support Dr Falconer and the Canberra Hospital in 2015.